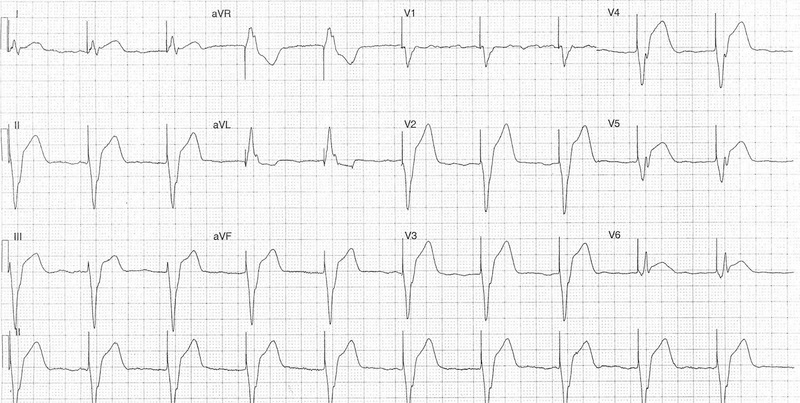 Concordant ST elevation occurs when there is ST elevation with a positive wide QRS complex, e.g. bundle branch blocks, ventricular rhythms or ventricular pacemakers. It is considered to be concordant because the ST segment moves in the same direction as the QRS. This sign is abnormal and can suggest coronary occlusion. This ECG is from a patient in their 70s who presented with intermittent chest pain for a couple of days that became constant shortly before they presented. This ECG shows ventricular paced rhythm with concordant ST elevation in V5. The cause was a mid-LAD occlusion of a wraparound LAD. This ECG is from a man in his 80s who presented with acute chest pain. This ECG shows LBBB with concordant STE in II, V5 and V6 due to inferior and lateral MI. This ECG is from a woman in her 80s who presented with chest pain. She had a history of 2nd degree AV block with PPM in-situ. This repeat ECG was recorded 60 min after presentation when she had further chest pain. This ECG shows ventricular pacing with concordant ST elevation in I and V6, and excessive discordant ST elevation in V2-4. The cause was an acute anterior MI. This ECG is from a female in her 60s presented with 2-3 days of fatigue and shortness of breath. She called EMS when her symptoms acutely worsened while she was shopping. EMS arrived and recorded a heart rate of 27. On arrival to the ED she was noted to be in complete heart block. She was given atropine with transient increase in HR to 80s. This ECG was recorded after atropine. This ECG shows sinus rhythm with second degree type 1 AV block and LBBB. Concordant ST elevation in III and aVF and concordant ST depression in V2. The cause was an occluded proximal right coronary artery. This was missed and the patient died.